The LIFESAVER jerrycan is perfect when needing a larger water supply when out on leisure or travel activities. Able to hold 18.5L at a time of water, and produce up to 20,000 Litres of clean, sterile water, the LIFESAVER jerrycan is your perfect travelling companion. Easy to lift and store in the boot of a car, caravan or to add a shower attachment to and use for washing and cleaning. The use of correct hand washing procedures could prevent up to 50% of waterborne gastrointestinal illnesses. One of the unique features of LIFESAVER products is the very high flow rate, 3 litres per minute. This has allowed us to include a Shower Attachment for sanitation and Hygiene use. When you have 20 tonnes of sterile water there is no need to wash in potentially unclean sources and risk contamination, the shower attachment plugs on and off in seconds. All LIFESAVER products operate FAILSAFE technology. As the LIFESAVER product approaches the end of ifs filtration capacity, it will require a greater number of pumps to induce water flow. When no more water can be induced to flow despite pumping, the cartridge has expired and needs replacing. The LIFESAVER technology is the world's first and only portable technology that removes all bacteria, viruses, cysts, parasites, fungi and all other microbiological waterborne pathogens without the aid of any foul tasting chemicals like iodine or chlorine or the need for any power or UV light. The LIFESAVER activated carbon filters are available to be brought separately, and can be used in conjunction with the LIFESAVER jerrycan 10,000UF and LIFESAVER jerrycan 20,000UF. They are made of high specification activated carbon block which reduces a broad spectrum of chemical residues including pesticides, endocrine, disrupting compounds, medical residues and heavy metals such as lead and copper. It also eliminates bad tastes and odours from contaminates such as chlorine and sulphur. Each LIFESAVER jerrycan activated carbon lasts 500L of water. These are available through the LIFESAVER shop. 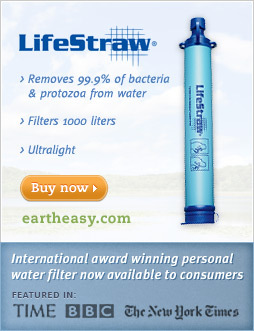 LIFESAVER technology filters down to 15 nanometres, that is 0.015microns. We are the world's first and only portable technology that is patented worldwide, to filter down to this level. With the smallest virus known being Polio at 25 nanometers, you are safe in the knowledge that LIFESAVER filters all bacteria, viruses, cysts and all waterborne pathogens from your water.